Attorney General Eric H. Holder Jr.’s recent resignation is not the first controversial issue to arise out of his nearly six-year career in the White House. Since his nomination process began, Holder’s career as Attorney General has been as groundbreaking as it has been inconsistent. His fierce defense of the Patient Protection and Affordable Care Act as well as his efforts to broaden civil rights have molded Holder’s legacy in the American Justice system as well as his impact on the shape of Obama’s presidency. While there is no doubt that Holder left a mark on the Obama’s presidency, it is unclear to what degree his legacy will make a lasting impact. This paper aims to quantify the effects that Holder’s legacy has had on the way Obama’s administration will be remembered in history. First, a brief discussion is undertaken about the role of Attorney General and what the position explicitly as well as implicitly entails. The roles discussed in the book Roles of the Attorney General of the United States will be used as a guide when analyzing Holder’s ability to fulfill the position.1 Then the analysis discusses Holder’s background and his successful career before his arrival on The Hill in 1997 as Deputy Attorney General during the Clinton administration. Next, some of Holder’s landmark work is analyzed using a model first created by Professor John O. McGinnis at Northwestern School of Law. According to McGinnis, an Attorney General wears various hats within his position. Each hat or model can be determined from an AG’s written opinions and include: the “independent authority” model, the “court-centered” model and “situational” model.2 It is through this lens that I attempt to classify and analyze Holder’s opinion model. In addition to the use of McGinnis’ model, I analyze some of the cases Holder has participated in, the work of his subcabinets and subordinates, as well as public statements made during press conferences or published by the Office of Public Affairs. All of these analyses provide further insight into the effect of Holder’s career on Obama’s governing and lead to a final conclusion summarizing Eric Holder’s legacy and its impact on Obama’s Presidency. 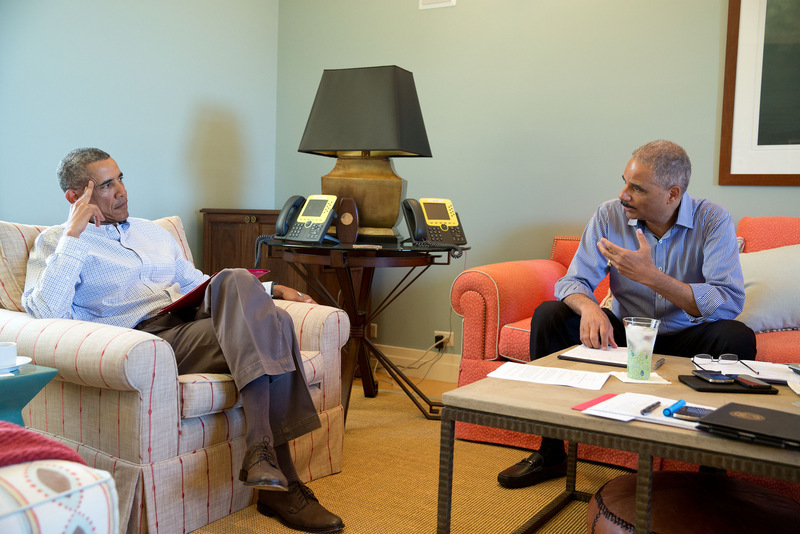 Attorney General Eric Holder with President Obama in the wake of the shooting incident in Ferguson, MO (August 2014). Before Congress first established the position of Attorney General in 1789, the legal advisor to the President was a poorly paid part time position.3 President George Washington once said in regards to the position, “ The salary of this office appears to have been fixed at what it is from a belief that the station would confer pre-eminence on its possessor, and procure for him a decided preference of professional employment.”4 It was thought then, that the prestige and honor of the position provided enough compensation than a salary provided to the rest of the President’s cabinet members. The Attorney General can be thought of having three masters: the President, Congress and the Courts. The Attorney General position is not explicit in the Constitution, and since the office was first created 1789 (it did not become the Department of Justice until 1870) the Attorney’s General actions must be granted through Congress or the Constitution. According to McGraw v. Dougherty, “…the functions of the Department of Justice, the powers and duties of the Attorney General and the duties of his assistants, are all subject to regulation by congressional legislation, and…the department is maintained and its activities are carried on under such appropriations as in the judgment of Congress are needed from year to year.”9 Additionally, the attorney general is required to make an annual report to congress. The AG’s other master, the US President, can be considered his most important client. When a President takes his oath into office, he swears, “ to take care that the laws are faithfully executed.” The AG as the “President’s Lawyer,” has a duty to ensure that the opinions he provides to the President and heads of executive departments satisfy that oath. Other responsibilities of the AG include, representing the Federal Government during all suits tried in the Supreme Courts, enforcing federal laws and supervising federal investigations and the federal penal system and directing the activities of the United States Attorneys and US Marshalls.10 The broad yet crucial roles of the AG do not lack its complications. One of the greatest challenges is the ability for the AG to balance his obligations to abide by the Constitution with the pressures of politics in the White House. Attorney General Edward Bates once said, “ The office I hold is not properly political, but strictly legal; and It is my duty, above all other ministers of state to uphold the Law and to resist all encroachments, from whatever quarter, of mere will and power.”11 However, President’s expect their AG’s to act as legal advocates rather than an impartial interpreter of constitutional law, further complicating the balance. The AG is then required to ensure the President does not come into any trouble for breaking Federal law but must also provide interpretations of Federal law that provides the President a legal framework in which he can take their desired action. Finally, the AG must answer to its third master: the Courts. The AG as amicus curiae, literally “a friend of the court,” derives its origins as early as Roman Law. Abbot’s legal dictionary defines amicus curiae: “a bystander who without having interest in the cause… makes suggestions on point of law or fact for the information of the presiding judge.”12 Although traditionally amicus curiae was limited to participate in court as a party neutral legal advisor, today the role has expanded. Amicus curiae is now thought to be partisan in its affairs in court. Acting as either an advocate of private or government interest, this expansion in understanding amicus curiae provides the AG opportunities to advance interests of the government through its intervention in the courts. One such example involves the AG’s ability to choose to represent certain parties in court. The AG could choose to represent one party privately but because defending that same party advances government interests, the AG serves as an advocate for both private and government parties. The consequences of this expansion in legal understanding and participation of amicus curiae is two fold. Although it grants the AG and executive branch substantial power over the formation of national policies, interest groups too gain some power in the form of “judicial lobbying.” With this broad understanding of this 200 year-old position, we can now begin to critically analyze how Eric Holder was able to fulfill the position of AG during his six-year tenure. The friendship between President Obama and AG Eric Holder began when the two were strategically seated next to each other at mutual friend Ann Walker Merchant’s dinner party in late 2004. Their similar backgrounds and experiences of having bi-racial parents, attending ivy-league schools and interests in basketball resulted in a budding friendship. When Obama decided to run for his first term, Holder immediately jumped on the opportunity to get involved with the campaign. Serving as an advisor on the campaign trail, the relationship between Holder and Obama continued to grow.16 With a background of almost 30 years as a prosecutor, judge and senior official within the Department of Justice, Holder was the obvious choice for Attorney General when Obama began his decision process on who to appoint to his cabinet. This statement may suggest more about the political climate and what had become a political norm since September 11, 2001 rather than the actual role of Attorney General. However, his following statement reveals his concerns over how the Bush administration addressed these issues within the political climate context. Holder states, “ I will work to restore the credibility of a Department badly shaken by allegations of improper political interference.”18 The implications here suggest that Holder would execute the position of attorney general under a more traditional understanding of amicus curiae adding, “Law enforcement decisions and personnel actions must be untainted by partisanship.”19 Holder also underlined the importance of the Justice Department’s role in protecting civil rights, making headway in protecting the environment, and ensuring fairness in the market place. 111th Congress of the United States. "Nomination of Eric H. Holder, Jr. Nominee to be Attorney General of the United States." Hearing before the Committee on the Judiciary United States Senate. Washington DC: United States Congress, 2008. 1-291. Barron, David J. Withdrawal of Office of Legal Counsel CIA Interrogation Opinions. Memorandum, United States Department of Justice, Washington DC: Office of Legal Counsel, 2009, 1. Barron, David. Memorandum for the Attorney General RE: Applicability of Federal Criminal laws and the Constitution to Contemplated Lethal Operations Against Shaykh Anwar al -Aulaqi. Memorandum, US Department of Justice , Washington DC: Office of Legal Counsel, 2010, 41. Caldwell, Leigh Ann, Jim Acosta, and Pamela Brown. "Attorney General Eric Holer Announces Resignation." CNN Politics. 9 25, 2014. http://www.cnn.com/2014/09/25/politics/eric-holder-resignation/ (accessed 11 21, 2014). Dayo, Olopade. "Eric Holder's War." The American Prospect, 2010: 12-17. Defendants' Memorandum in Opposition to Plaintiff's Motion for Summary Judgment. 3:10-cv-00091-RV/EMT (District Court for the Northern District of Florida Pensacola Division, 11 23, 2010). French, Bill, and John Bradshaw. Ending the Enless War: An Incramental Approach to Repealing the 2001 AUMF. Policy Analysis, Washington DC: National Security Network, 2014, 35. Garrison, Arthur H. "The Opinions by the Attorney General and the Office of Legal Counsel: How and Why they are Significant." The Albany Law Review 76 (2012): 217 - 246. Hogan Lovells US LLP. New Requirements imposed by the Violence Against Women Reauthorization Act. Law Provision Summary, Washington DC: American Council on Education, 2014, 3. Holder, Eric. "Letter from the Attorney General to Congress Regarding Defense of Marriage Act." Washington DC: Office of the Attorney General , 2 23, 2011. 6. Hutson, Luther A., Arthur Selwyn Miller, Samuel Krislov, and Robert G. Dixon Jr. . Roles of the Attorney General of the United States. Washington, DC: American Enterprise Institute, 1968. Johnson, Dawn. "Obama Administration's Decision to Defend Constitutional Equality Rather than the Defense of Marriage Act." Fordham Law Review 81 (2012): 20. McGinnis, John O. "Models of the Opinion Function of the Attorney General: A normative, Descriptive, and Historical Prolegomenon." Cardoza Law Review (Yeshiva University), October 1993: 377-435. Office of Public Affairs. "Attorney General Eric Holder Delivers Remarks on the Supreme Court Decision in Shelby County v. Holder." The United States Department of Justice - Justice News. 1 25, 2013. http://www.justice.gov/opa/speech/attorney-general-eric-holder-delivers-remarks-supreme-court-decision-shelby-county-v (accessed 11 12, 2014). Office of Public Affairs. "Attorney General Holder Announces $2.6 Million in Grants for Domestic Violence Homicide Prevention." United States Department of Justice - Justice News. 9 22, 2014. http://www.justice.gov/opa/pr/attorney-general-holder-announces-26-million-grants-domestic-violence-homicide-prevention (accessed 11 14, 2014). Office of Public Affairs. "Department of Justice Announces University Tour by Administration Officials to Raise Awareness of Campus Sexual Assault." THe united States Department of Justice - Justice News. 4 21, 2014. http://www.justice.gov/opa/pr/department-justice-announces-university-tour-administration-officials-raise-awareness-campus (accessed 11 20, 2014). Office of Public Affairs. "Office on Violence Against Women Announces Two New Grants to Support Prosecutorial and Victim Services in Rural and Tribal Communities in the Bakken Region." The United States Department of Justice - Justice News. 4 25, 2014. http://www.justice.gov/opa/pr/office-violence-against-women-announces-two-new-grants-support-prosecutorial-and-victim (accessed 11 15, 2014). Office of Public Affairs. "Statement of Attorney General Eric Holder on Closure of Investigation into the Interrogation of Certain Detainees." United States Department of Justice - Justice news. 8 30, 2012. http://www.justice.gov/opa/pr/statement-attorney-general-eric-holder-closure-investigation-interrogation-certain-detainees (accessed 11 19, 2014). Office of Public Affairs. "Statment by Attorney General Eric Holder on the House Passage of the Reauthorization of the Violence Against Women Act." United States Department of Justice- Justice News. 2 28, 2013. http://www.justice.gov/opa/pr/statement-attorney-general-eric-holder-house-passage-reauthorization-violence-against-women (accessed 11 20, 2014). Tea Party, Inc. No Obamacare. http://www.teaparty.org/no-obamacare/ (accessed 11 21, 2014). The Biography.com Website. Eric Holder. A&E Television Networks. 2014. http://www.biography.com/people/eric-holder-391612 (accessed 11 17, 2014). United States Department of Justice. Agencies. 11 26, 2012. http://www.justice.gov/doj/agencies-0 (accessed 11 15, 2014). US Department of Health and Human Services. "The Affordable Care Act is Working." HHS.gov/Health Care. 11 21, 2014. http://www.hhs.gov/healthcare/facts/factsheets/2014/10/affordable-care-act-is-working.html (accessed 11 22, 2014). 46.) However, limitations on this analysis should be noted. Holder’s work goes far beyond the examples chosen for the sake of this analysis. Therefore, the analysis done through this limited scope is not all encompassing. 48.) Tea Party, Inc. n.d.
Federika A. Cariati graduated in 2014 with a Bachelors degree in Political Science from Northeastern University in Boston, MA.